Try this. 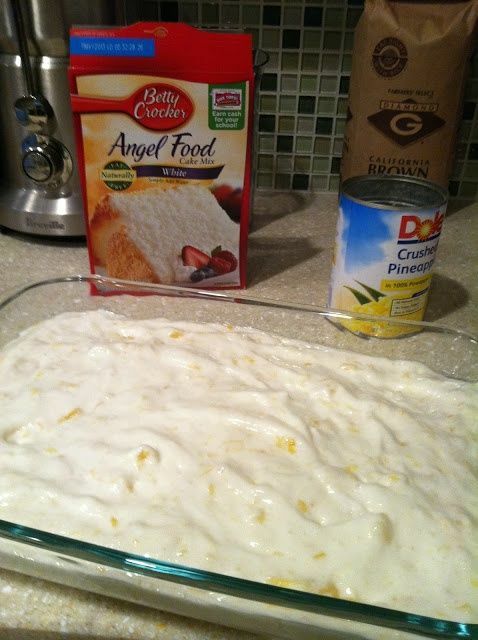 Take box of Angel Food Cake mix (just the contents of the box, no need to follow the directions on the box), and combine it with a 20 ounce can of crushed pineapple in its own juice. (No need to use a mixer, just stir it by hand) When you do this, something magical happens. The mixture starts to froth and it turns into an amazingly airy, fluffy bowl of deliciousness right before your eyes. Once it’s all mixed up, simply pour it into a 9 x 13 pan and bake it at 350 for 30 min. For other yummy recipies that are tried and true take a look at this. Available in paperback and e-reader on Amazon.com.